There are several industrial applications, especially within manufacturing where the distance, absence or presence of an object needs to be measured. A photoelectric sensor is used for such purposes. A photoelectric sensor is a position sensing device that uses a modulated light beam to detect its target. The absence or presence of the target is dependent on the reflection of the light beam. 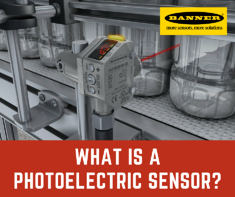 The simplest example of a photoelectric sensor in use is at the entrance of a grocery store, where the glass door opens as soon as the customer walks in front of it. A photoelectric sensor makes use of modulated light, which is pulsed at a specific frequency between 5 & 30 kHz. Modulated light is used as it reduces the chances of ambient light affecting the sensor’s performance. LEDs are usually used as sources. In such a model, the light transmitting as well as the receiving element are housed in the same enclosure. This model separates the transmitter and the receiver. Presence of an object is recorded whenever the contact between the transmitter and the receiver is broken. Both the transmitting and the receiving elements are contained within the same housing. This time constant contact is maintained between the two through a reflector. Whenever this contact is broken by an object, presence is recorded. This photoelectric sensor solves many challenging applications and comes in a rugged IP69K rating with FDA food grade stainless steel casing. Check out the video below! Several environments, especially industrial ones are wrought with contaminants including dust, smoke, moisture, dirt, etc. A sensor that operates in such conditions is prone to registering false-positives and therefore requires more light for proper operation. System engineers should always be clear as to what the requirements are, and select the appropriate sensor after due diligence. Interested in learning more about Banner Engineering Sensors?